By Mateusz Mucha and Dominik Czernia - PhD candidate. What is the percentage? - How to find the percentage of something? How to calculate the percentage? What's the percentage formula? Spelling - percent or per cent? What is per mille? What is a basis point? 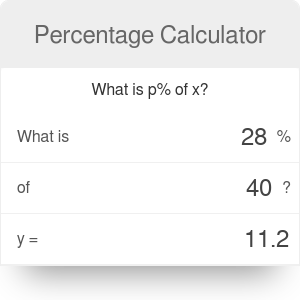 This percentage calculator is a tool that lets you do a simple calculation: what percent of X is Y? The tool is pretty straightforward. All you need to do is fill in two fields, and the third one will be calculated for you automatically. This method will allow you to answer the question of how to find a percentage of two numbers. Furthermore, our percentage calculator also allows you to perform calculations the opposite way, i.e., how to find a percentage of a number. Try entering various values into the different field and see how quick and easy-to-use this handy tool is. Is only knowing how to get a percentage of a number is not enough for you? If you are looking for more extensive calculations, hit the advanced mode button under the calculator. Other than being helpful with learning percentages and fractions, this tool is useful in many different situations. You can find percentages in almost every aspect of your life! Anyone who has ever been to the shopping mall has surely seen dozens of signs with a large percentage symbol saying "discount!". And this is only one of many other examples of percentages. They frequently appear, e.g., in finance where we used them to find an amount of income tax or sales tax, or in health to express what is your body fat. Keep reading if you would like to see how to find a percentage of something, whats the percentage formula is and what are the applications of percentages in other areas of life, like statistics or physics. and finally, percentage difference takes care of a very similar concept, used when we don't know the direction of the calculation (from number A to B or B to A). Percentage is one of many ways to express a dimensionless ratio of two numbers. It's very popular since it can describe situations that involve large numbers (e.g., estimating chances for winning the lottery), average (e.g., determining final grade of your course) as well as very small ones (like volumetric proportion of NO₂ in the air, also frequently expressed by PPM - parts per million). One percent is a hundredth. As a percent sign, we usually use %, but sometimes it is denoted by pct. It means that 5 percent is the same as 5%, 5 pct, 0.05, 5/100 or five hundredths. It is as simple as that, and this percentage calculator is a tool dedicated to working with decimal fractions and percentages. If you're seeking more complicated problems, try to figure out how to calculate the percentage of a percentage. This is all nice, but we usually do not use percents just by themselves. Mostly, we want to answer how big is one number in relation to another number?. To try to visualize it, imagine that we have something everyone likes, for example, a large packet of cookies (or donuts or chocolates, whatever you prefer 😉 - we will stick to cookies). Let's try to find an answer to the question of what is 40% of 20? It is 40 hundredths of 20, so if we divided 20 cookies into 100 even parts (good luck with that! ), 40 of those parts would be 40% of 20 cookies. Let's do the math: 40/100 * 20 = 8. A handy little tip: to divide by 100, simply move the dot two spaces to the left. In our calculation, 40/100 * 20 could be done as (40 * 20)/100 (it's the same thing). 40 * 20 is 800. By moving the dot in 800 by two digits to the left, you get 8.00, and when you get rid of all unnecessary zeros, you obtain 8. In our calculator, enter 40 and 20 (so it reads "40% of 20" is 8). Percentage is also a way to express the relation between two numbers as a fraction of 100. In other words, the percentage tells us how one number relates to another. 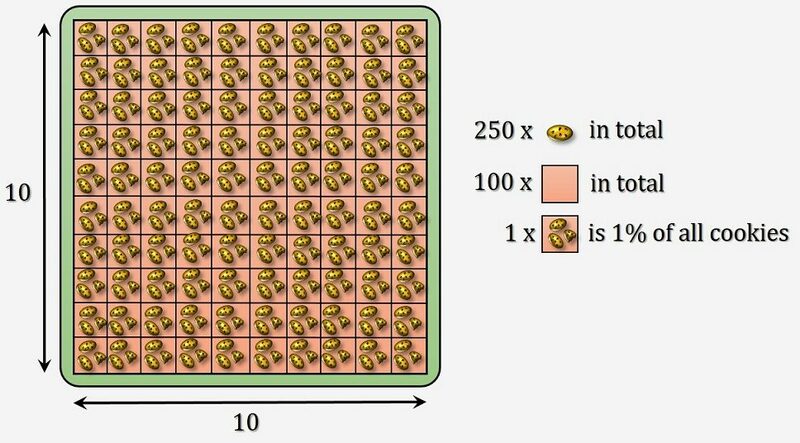 If we know that number A is 25% of number B, we know that A to B is like 25 is to 100, or, after one more transformation, like 1 to 4, i.e., A is four times smaller than B. This is what the percentage calculator teaches; what is percentage and how to find a percentage of two numbers. It is essential and practical knowledge. Why? Let's say that B represents the mass of a human body or the mass of some air. Then, by denoting A as a mass of water, we can find out what is the total body water percentage or relative humidity (used to calculate the dew point of air). How to find percentage of something? It's easiest to explain what is the percentage with cookies. It is surprising how often cookies save the day, right? Say we have a big drawer with 100 compartments (a 10 x 10 grid). Every compartment is one hundredth or 1% of the whole drawer. We then fill this drawer with cookies in a way that gives us exactly the same number of cookies in each compartment. At first, let's start with the most straightforward example with 100 cookies. How to get the percentage of a number of, let's say, five cookies? It's easy: every compartment gets exactly one cookie. So one percent of 100 is one cookie, and five percent is five cookies. Let's go with something a bit harder and four times more delicious: 400 cookies! We're dividing them evenly, and every compartment gets four cookies. Cookies look smaller, but in our imagination, they are the same, just the drawer is much bigger! One percent of 400 is 4. How about 15 percent? It's 15 compartments times four cookies - 60 cookies. Our tummies start to ache a little, but it has never stopped us from eating more cookies! Now, something even harder - 250 cookies. Oh-oh, we divided up the first 200 cookies, placing two in every compartment. Now we are left with 50 cookies that need to be spread evenly, hmmm, it's half a cookie in every box. How to calculate the percentage? You are right - this time 1 percent of the total number of 250 cookies is 2.5. How many do we have in 15 boxes? 2.5 * 15 is 37.5. So what is percentage good for? As we wrote earlier, a percentage is a way to express a ratio. Say you are taking a graded exam. If we told you that you got 123 points, it really would not tell you anything. 123 out of what? Now, if we told you that you got 82%, percent is reliable information. Even if we told you, you got 123 out of 150, it's harder to feel how well you did. A week earlier there was another exam, and you scored 195 of 250, or 78%. While it's hard to compare 128 of 150 to 195 of 250, it's easy to tell that 82% score is better than 78%. Isn't percent sign helpful? After all, it's the percentage that counts! What about decimal fractions and percentages? Percentages can easily be converted to decimals. Just divide the percentage by 100, and you are set. 15% is the same as 0.15. So as we have shown before, 0.15 of 250 cookies is thirty-seven and a half. Percentages are sometimes better at expressing various quantities than decimal fractions in chemistry or physics. For example, it is much convenient to say that percentage concentration of a specific substance is 15.7% than that there are 18.66 grams of substance in 118.66 grams of solution (like in an example in percentage concentration calculator). Another example is efficiency (or its special case - Carnot efficiency). Is it better to say that car engine works with efficiency of 20% or that it produces energy of 0.2 kWh from the input energy of 1 kWh? What do you think? We are sure that you're already well aware that knowledge of how to get a percentage of a number is a valuable ability. While it's certainly quick and painless just to use our percentage calculator, you don't always have access to a computer or a smartphone. Also, it's just plain cool to be able to perform calculations in your head. Maybe not as cool as juggling flaming torches, but close. The percentage tells you how number A relates to number B. A real world example could be: there are two girls in a group of five children. What's the percentage of girls? In other words, we want to know what's the ratio of girls to all children. It's 2 out of 5, or 2/5. We call the first number (2) a numerator and the second number (5) a denominator because this is a fraction. To calculate the percentage, multiply this fraction by 100 and add a percent sign. 100 * numerator / denominator = percentage. In our example it's 100 * 2/5 = 100 * 0.4 = 40. Forty percent of the group are girls. That's the entire procedure of converting between decimal fractions and percentages. Speaking of decimal fractions, there is a way to write very big or very small numbers concisely. Check it out with our scientific notation calculator! Do you have problems with simplifying fractions? The best way to solve this is by finding the GCF (Greatest Common Factor) of the numerator and denominator and divide both of them by GCF. You might find our GCF and LCM calculator to be convenient here. It searches all the factors of both numbers and then shows the greatest common one. As the name suggests, it also estimates the LCM which stands for the Least Common Multiple. Let's go the other way around and try to find the numerator. Say we know that 70 percent of fruits in the basket are apples and there are 30 fruits altogether. It could be worse - they could be lemons. So how many apples do we have? Let's get our percentage formula: 100 * numerator / denominator = percentage. We want to find out the numerator. Let's move all the other parts of the equation to the other side. Divide both sides by 100 (to get rid of 100 on the left) and then multiply both sides by the denominator. This is what we get: numerator = percentage * denominator / 100. Let's substitute percentage and denominator with our values: numerator = 70 * 30 / 100. Now it's easy: numerator = 1800 / 100 = 18, we have 18 apples. Should be enough for lunch or a rather violent food fight. Now let's solve a problem with an unknown denominator. We spent 30 percent of our pocket money on bubble gum (we never said we're great investors). We bought 12 sticks for $1 each. So we know that $12 was 30 percent of our total budget. How much money did we have before we almost literally blew it all away? Let's start with our formula: 100 * numerator / denominator = percentage or 100 * 12 / denominator = 30. This time we want to find out the denominator. Let's multiply both sides by the denominator and then divide by percentage. This way, we'll get 100 * 12 / 30 = denominator. And the other way around, denominator = 100 * 12 / 30 = 1200 / 30 = 40. We had 40 dollars, and we spent 30 percent, or $12, on bubble gum. Totally worth it. the formula for percentage is this: percentage = 100 * part / whole, and it answers the question "what percentage of 20 is 8". the formula for a part is: part = whole * percentage / 100, and it gives an answer to "what is 40% of 20?". and finally, the formula for a whole is: whole = 100 * part / percentage, and it says "what is 100% if 8 is 40%?". That's technically all. You should now know how to find the percentage of a number. Believe or not, but knowing how to calculate percentages is essential in sports. Are you supporting any sports team? We've got some interesting tools for you which involve percentages. Check our winning percentage calculator to see how good the last season really was for your favorite team. Also, if you're planning to bet on your team (or make any other investment), visit the risk calculator to find out which option is safer. Although Ancient Romans used roman numerals I, V, X, L and so on, calculations were often performed in fractions that were divided by 100. It was an equivalent to the computing percentages that we know nowadays. 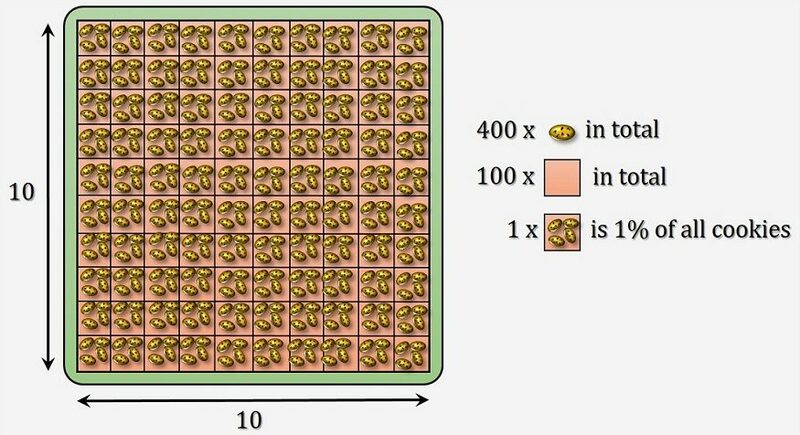 Computations with a denominator of 100 became more standard after the introducing of the decimal system. Many of the medieval arithmetic texts applied this method to describe finances, e.g., interest rates. However, the percent sign % we know today only became popular a little while ago, in the 20th century, after years of constant evolution. The term percent is often attributed to Latin per centum, that means by a hundred. Actually, it is wrong. We got the term from Italian per cento - for a hundred. The percent sign % evolved by the gradual contraction of those words over centuries. Eventually, cento has taken the shape of two circles separated by a horizontal line, from which the modern % symbol is derived. The history of mathematical symbols is sometimes astonishing. We encourage you to take a look at the origin of the square root symbol! Recently, the percent symbol is widely used in programming languages as an operator. Usually, it stands for the modulo operation. On the other hand, in experimental physics, the symbol % has a special meaning. It is used to express the relative error between the true value and the observed value found in a measurement. Later in the text, we explain in more detail what per mille means, what is a basis point and how to convert per milles and basis points to percents. Higher proportions use other notation (called parts-per notation), e.g., parts-per-million (PPM) which is frequently used to measure the concentration of a substance in solution or mixture. Of current concern is smog, the tiny particulate matter that enters the air and can seriously effect someones health. Visit our smog calculator to see how many cigarettes do you "smoke" just by inhaling air and how can you counteract the spread of pollutions. Percent or per cent? It depends on your diet, really. If you eat hamburgers for the majority of your meals, it is percent. If you prefer fish and chips, it is per cent. If you spray your fish-smelling chips with vinegar, then it is per cent, mate (as opposed to burger eaters' percent, dude). When it comes to percentage, both sides of the pond are in agreement: it should be a single word. Still confused? Americans say percent, British use per cent. Something tells us that American English is more popular nowadays, so this website uses a single-word form. After a delicious lunch, there's a time for a cup of coffee. It may sound quite weird for you, what do coffee and percentage have in common? Our coffee kick calculator tells you what your level of alertness is in percentages during the day! Check out how a dose of caffeine help you remain focused! Also, if you're a real coffee-lover, try our other tools. With coffee to water ratio calculator, you can find a perfect ratio of ingredients to prepare your cup of coffee and caffeine calculator shows you how much caffeine you've had during a day. Be aware that caffeine can be overdosed too! Per mille, per mil, per mill or simply ‰ is similar to percent, only it is one thousandth (1/1000 or 0.001). If our household's budget is $2400 and we allocated 1 per mille of that to buying chewing gum, we would spend 2.4 dollars (2 dollars 40 cents) on annoying our teachers (well, 20 years ago it was not allowed in Polish schools. We do not know the rules nowadays 😃). It's pretty similar to how you find percentages. If you wanted to use percentage calculator to count per mille, simply use numbers 10x lower (0.2 instead of 2, 4 instead of 40). Per myriad, basis point or just ‱ is one ten thousandth(1/10000 or 0.0001). 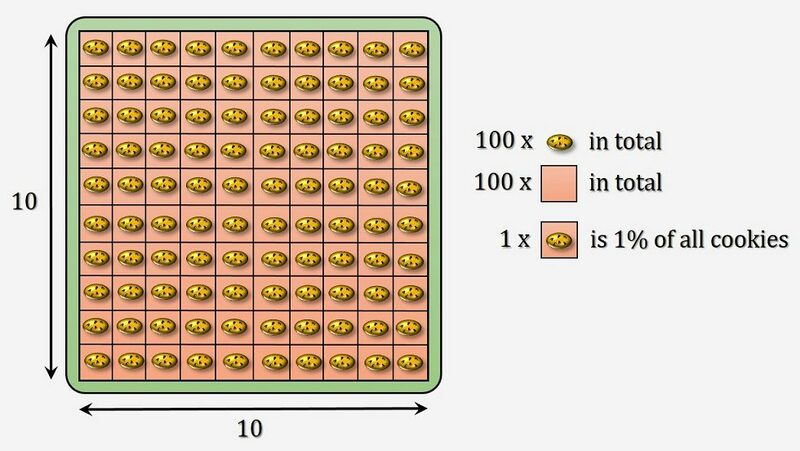 It's 10x smaller than per mille, so to convert basis points to percents, you need to divide them by 100. It's that simple! Percentage points (or percent points) are a rather tricky beast. We use it all the time even if we don't know it - and in these situations, we often incorrectly say percent instead of a percentage point. Once you read this section, you will know how to do it properly and will be annoyed for the rest of your life (because other people will keep making the mistake). We can already say that percentage points play an essential role in statistics, e.g., in the normal distribution, binomial distribution, or to find the confidence interval for a sample of data (confidence level is usually at 95 percentage points). Senator Homer Simpson was polling at 10% last month. He had a few successful debates since then, and now 12% of the population wants to vote for him. What's the change? You want to say 2%, are we right? It's wrong! Let's examine this. Imagine the whole population is 1000 people. 10% of them is 100. 12% is 120. What's the percentage increase? It's 100 * 20 / 100 = 20%! This is when percentage points come in handy. We use percentage points when we want to talk about a change from one percentage to another. A change from 10% to 12% is two percentage points (or 20 percent). change in percentage points is in relation to the whole part (whole is the entire population or 1000 in our example. 1% of that is 10). To calculate percentage points, simply subtract one percentage from another. 30% is 20 percentage points higher than 10%. Percentage point can be abbreviated as pp. Mateusz Mucha and Dominik Czernia - PhD candidate. Percentage Calculator can be embedded on your website to enrich the content you wrote and make it easier for your visitors to understand your message.